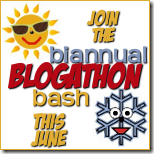 A YEAR OF JUBILEE REVIEWS: Bi-Annual Blogathon Wrap Up! I learned a TON in the blogathon! Things I didn't even know, that I didn't know! I already have the January event written on my calendar and I hope I can plan ahead to fully clear my calendar. No kids bdays that weekend taking away my time! Then to top it off this weekend I was sick all day on Sunday! I am sure there were more. This was a very productive weekend in the behind the scenes look at my blog and I am so glad I participated! I didn't finish everything on my to-do list but will continue to work toward them. Wow, Melanie, you really did accomplish a lot! Congrats, and hope to see you again.